Learn more about what to roof insurance assistance. Affordable Roofing by John Cadwell, Inc. does not participate in Assignment of Benefits (AOB) . AOB gives the third party authority to file a claim, make repair decisions and collect insurance payments without your involvement. Review the resources below to better understand how transferring your insurance claims rights can impact you and your family. We do, however, assist with your insurance claims. As far as the insurance company is concerned, if you were aware of something that was slightly damaged and didn’t take the necessary precautions to prevent further disrepair, they may not pay for it. If that small hole in the roof becomes a huge gaping tear that results in the destruction of your property, your homeowner’s insurance claim can be denied on the basis of your negligence. Temporary repairs or coverings are also covered by insurance to protect your property from further loss or damage. Submit your receipt and/or photos to your homeowner’s insurance company. Don’t wait! Report the possible loss; let the professionals determine the extent of the damage. 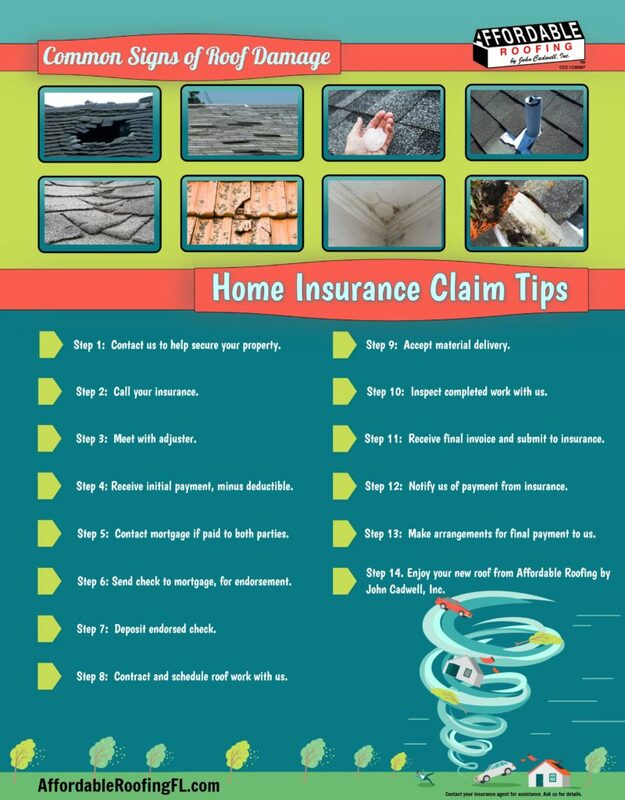 Giving them notice of damages immediately will help your homeowner’s insurance claim process more efficiently. If there’s a flood in your home, do not - we repeat, do NOT - wait for the water to go down. Call your agent right away and ask just exactly what information about your circumstances your insurer will need to know. To insure the scope includes all roofing damages and your needs are met at a "price agreeable" we will professionally represent you and meet with your adjuster, or if you have already had your adjuster inspect the property and confirm the damage we can contact your adjuster to confirm coverage. Do not be surprised if your estimate and your loss summary report from your insurance carrier do not match. Your insurance company will provide you a check for the Actual Cost Value (ACV) or the depreciated cost of the roof minus the deductible. Ask your insurance agent for details specific to your policy. For roofs more than 10 years old, insurance may only provide reimbursement for the depreciated value, minus deductible, of your roof (ACV) not Replacement Cost Value (RCV). If your policy has Replacement Cost Value (RCV) you can submit a request for remaining funds disbursement upon completion of the job with a final invoice we will provide to you. Advise them of your claim and inquire about their procedures for draft endorsement and contractor's affidavits, lien releases, etc. Be proactive. Send check through priority mail to mortgage company. DO NOT endorse the check, send the check to your mortgage company and request their endorsement, first. Once your insurance check is returned with the mortgage company endorsement you can then endorse and deposit it into your own bank account. Review & schedule project. If deposit is not made, contact us to make arrangements for initial deposit, usually equal to your deductible. Review your Affordable Roofing contract terms for more information. Verify the materials and color with your contractor. Provide any other required monies/deposits as per contract. Inspect your project and do a final-walk through. Once the job is completed and you are 100% satisfied with the work, you will receive the final invoice. Send your final invoice to your insurance company through priority mail. If instructed by insurance company, a request to file a betterment claim may be required with final invoice. Upon receipt of payment please notify us so we can note it in your customer file. Endorsements may be required from one or more parties. If your insurance has issued the payment to Affordable Roofing, we will contact you to notify you of such payment. Upon issuing the final payment to Affordable Roofing, you will receive all of your warranty papers and a paid invoice. We understand insurance claims are a process and must allow time for them to process payments to the homeowner; however, homeowners need to be proactive to ensure payment to Affordable Roofing is prompt to avoid possible late fees. See contract terms for details. Secure all documents: Keep all documentation in a safe place and treat it as you would any warranty information. Enjoy your newly restored home and peace of mind!